A new ripper design (pictured) rips at two depths (300-millimetre tynes at front and 600mm tynes at rear) in one pass. Inclusion plates on the rear tynes are being trialled to incorporate topsoil and soil ameliorants such as lime or gypsum to depth. A new ripper design being evaluated by the Department of Agriculture and Food, Western Australia (DAFWA), across the WA wheatbelt is showing promise for removing compaction at depths of 50 to 60 centimetres (pictured). The ripper has two rows of in-line tynes: one at the front that rips to 30 centimetres and one at the back that rips to 60cm. The front (or leading) row of tynes reduces the power (draft force) required to pull the ripper, which is a major cost of the deep-ripping process. The dual set of tynes removes the compaction layer more effectively as the leading tynes pave the way for the rear tynes to penetrate more effectively at depth. Recent DAFWA research demonstrated that the addition of a single, shallow leading tyne working in-line and ahead of a deep-ripping tyne could reduce the ripping draft force on clay soils by up to 18 per cent and on sandy-textured soils by 10 to 15 per cent (Table 1). 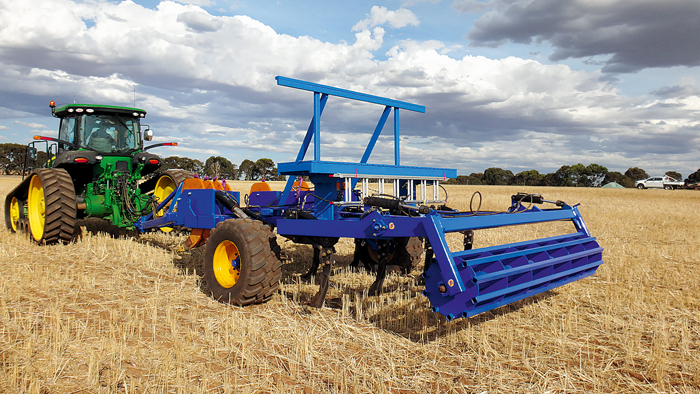 The new ripper design has been developed to cope with the increased depth of soil compaction now common across the WA wheatbelt, which has resulted from the heavier cropping machinery used over the past decade. An additional feature of the new design is the inclusion plates fitted to the rear tynes, which hold open the ripped slot while topsoil with or without ameliorants falls or is dragged into the ripped section by chains. Slotting of topsoil organic matter, lime and gypsum into the ripped section is being evaluated for its capacity to improve soil structure and pH at depth and prolong the ripping benefit. 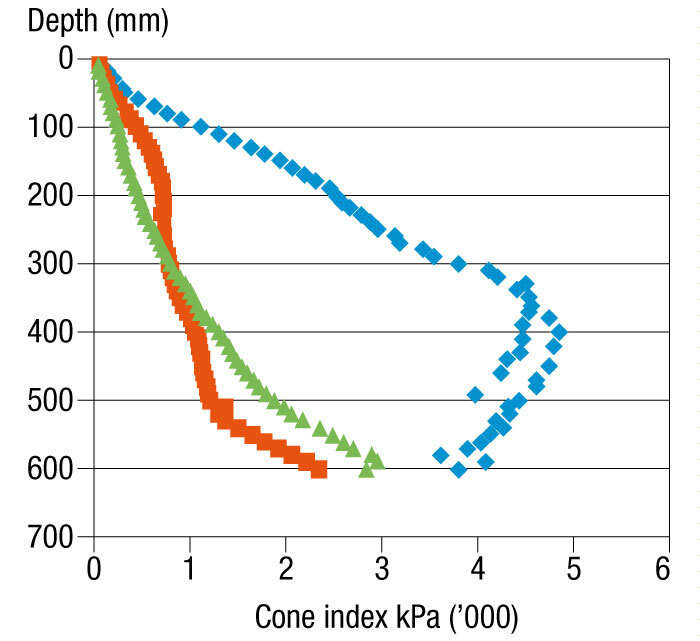 Figure 1 Soil penetration resistance profiles in moist soil at Munglinup, May 2015, using a prototype version of a new dual-tyned ripper developed to remove deep compaction. Ripping with the inclusion plates has successfully moved topsoil down the profile in the ripping slots and early measurements show the ripping has reduced the penetration resistance of the soil (Figure 1). Observations of volunteer canola with long taproots in some of the ripped plots support the lowered soil-resistance measurements. The modified deep ripper is being trialled at six locations across the WA wheatbelt in 2015 and on a range of soil types, from deep coloured and deep earthy sands, deep pale sand over gravel, dense york gum duplex, gimlet loam and sand and gravel over clay. The results of the trials will be evaluated over the next four years with a variety of different treatments incorporated using opening plates such as lime, gypsum and organic matter including topsoil used at the sites in order to further improve the economics of removing deep compaction. Read this article in GC issue 118 - Subscribe and recieve the hard copy of GroundCover in your mailbox for free, remember to select 'Post' as your subscription method.